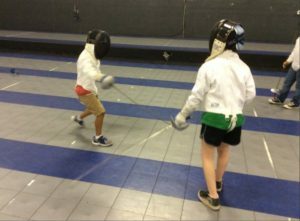 Camps are a great way to boost skills and advance more rapidly in an focused setting, or for an introduction to Olympic saber fencing in our fun and exciting Learn To Fence Camps. We offer several camps throughout the year in our club and in the City of Hillsboro Parks and Recreation Centers (see their website directly – City of Hillsboro activities guide. Unleash that inner Jedi knight or Musketeer and get off that device! Fun, warm up games focus on agility, co-ordination, paying attention. Learn the basic defense and attack skills. Drills for blade work, technique and beginner tactics. 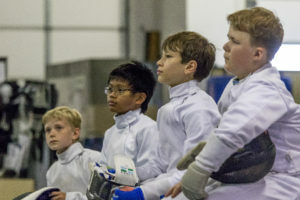 Fencing teaches creative problem solving, listening skills, discipline, good sportsmanship, self-confidence, perseverance and a host of wonderful life skills, most importantly it’s fun! Professional coaches lead an active, fun class learning to master the sword and making new friends. Wear a light comfy T-shirt, long basketball shorts or comfortable pants (Knees should be covered) and wear tighly fitting athletic shoes..
Held at the Tyson Recreation Center. For those in our Competitive Level 2 class or by coach invitation. Camp focus is on preparation for summer national championships and the July challenge. Whether you are going to nationals or not this camp will help your competitive level as you help the team prepare. Camp will focus on blade-work, tactical awareness, sportsmanship, mental preparation, understanding and adapting to referee calls. Lots of fun games for agility, balance, focus, inspiration and competitiveness. Bring your water bottle, lunch and a snack. Fitness daily. Competitive class level 1 or by coach recommendation. For those in our Competitive Level 1 class, or going to summer nationals or by coach invitation. Camp focus is on preparation for summer national championships and the July challenge. Whether you are going to nationals or not this camp will help your competitive level as you help the team prepare. Camp will focus on blade-work, tactical awareness, adapting to referee’s and opponents, mental preparation, referee awareness. Lots of fun games for agility, balance, focus, inspiration and competitiveness. Bring your water bottle, lunch and a snack. Fitness daily. Must have full electric gear. Limited homestays available for our out of town campers (minor age) on a limited basis @$35.00 per day, includes daily transportation and lunch for camp – for minor age campers. Full Day Session: 9:00 – 3:50 daily. different drills. Field trip on Wednesday for full day campers to have a change of pace active fun. 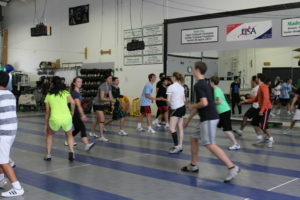 For several participants this camp can lead to a class promotion to the next level up. Daily fitness. Club Members $375.00 Non – members $475.00 additional home-stays for minor age children at $35.00 per day, limited space. Our popular annual International Hi performance summer camp is always exciting. We invite visiting fencers to join us and train for the start of the 2019-2020 competition season that starts in Sept. 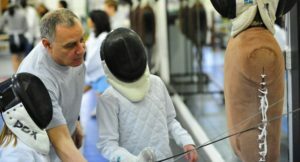 Many of our collegiate fencers who are home participate in this camp. This high intensity camp will work on skills, competitiveness, mental strength, Opponent analysis, tactical and critical decision making, distance control, advanced blade work technique, changes in referee calls, etc. Fitness included daily. Bring your lunch and a drink. Must have full electric gear. Limited home-stays for minor age children at $35.00 per day-includes daily transportation. There is a hotel in walking distance to camp. We have welcomed fencers from China, Taiwan, Mexico, Germany, England, France, Puerto Rico and Spain. Our annual Intermediate level Intensive saber camp is geared for fun, fitness and getting ready for the upcoming competition season that starts the beginning of September. It’s also a boost so those who are close to moving from the pre-competitive class to the Competive 1 Class level can prepare to move. Some students can be promoted after the camp based on how they did during the camp. Fitness daily, fun games for agility, competitiveness, along with drills, footwork, bladework, critical thinking, mental preparation, tactics, etc. Must have electric gear. Bring lunch and water bottle. Field trip on Wed. to break up the intensity. Saturday camp starts with our camp tournament at 11:00 a.m and ends after the tournament, approx. 2:00.